Newly renovated and clean. 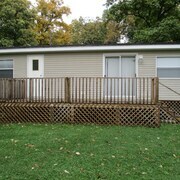 Has the basic room amenities of fridge and microwave, ironing board and coffee maker. Where to find Amherstburg hotels near an airport? Where can I find hotels in Amherstburg that are near tourist attractions? While there are currently no Expedia-listed hotels in the immediate vicinity of Amherstburg, Expedia does list a minumum of 7 options that are located within 20-30 minutes by car from Amherstburg. The nearest of our hotels is the MGM Grand Detroit, Michigan, which is located 25 kilometres (16 miles) from the heart of Amherstburg. Also, you could check out the Detroit Marriott at the Renaissance Center, located in Michigan, which is 25 kilometres (16 miles) away. 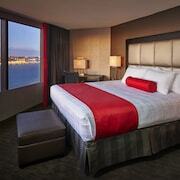 You could try the The Westin Book Cadillac Detroit as well as the The Westin Detroit Metropolitan Airport. The The Westin Book Cadillac Detroit can be found 25 kilometres (16 miles) from the center of Amherstburg. 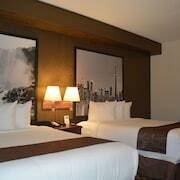 The The Westin Detroit Metropolitan Airport, is 25 kilometres (15 miles) away. Some other Expedia-listed accommodations are the Hilton Garden Inn Detroit Downtown and the The Henry Hotel, Autograph Collection. While you are in Amherstburg, ensure you have enough time to check out Southern Ontario's other attractions. Southern Ontario has beaches, coastal plains, forests and lakes, and commonly visited Southern Ontario attractions include traditional villages. In this part of Canada visitors can enjoy skiing. The nearest accommodation options in Windsor include Leamington and Wheatley. Leamington is 45 kilometres (28 miles) to the east of Amherstburg, while Wheatley is 55 kilometres (33 miles) to the east. Leamington accommodations include the Best Western Plus Leamington Hotel & Conference Centre and Anchors Away. The Wenzler's Landing Bed & Breakfast and Omstead's On Erie are amongst the hotels in Wheatley. If enjoying sport is what you love, head to Windsor Raceway, which is 17 kilometres (11 miles) to the north of Amherstburg. Those wishing to find a bed near to the sporting action can select from the Holiday Inn & Suites Windsor Ambassador Bridge or the Hampton Inn & Suites by Hilton Windsor. 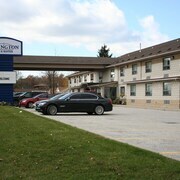 For travelers planning on arriving or departing through Windsor Airport, you can book a bed at Lexington Inn & Suites - Windsor ON Canada, or Ramada Limited Windsor, both of which are a short trip away. What are the most popular Amherstburg hotels? Are there hotels in other cities near Amherstburg? What other types of accommodations are available in Amherstburg? Explore Amherstburg with Expedia.ca’s Travel Guides to find the best flights, cars, holiday packages and more!